Connecticut tolls were rescinded in 1983. Connecticut does not currently collect tolls for use of its turnpikes and highways; however, any information about new tolls in Connecticut will be posted here. Information provided below is generic toll pass information for other states. Tolls are currently not collected in Connecticut. Please select another state if you wish to order a toll pass. Connecticut stopped collecting tolls on its turnpikes in the 1980's; however, a study has been funded to consider the option of reinstating tolls some time during the early 2020's. There are currently no tolls collected in Connecticut; as a result, there is no need for the use of any toll pass. Not all states' transponders are yet compatible, although toll interoperability has been mandated by Congress. Read more about this in our news section. You must make sure your electronic pass is compatible with other states' tolling systems before you assume your transponder will be read in another state. The E-ZPass system is the largest interoperable toll collection and payment system in the United States. 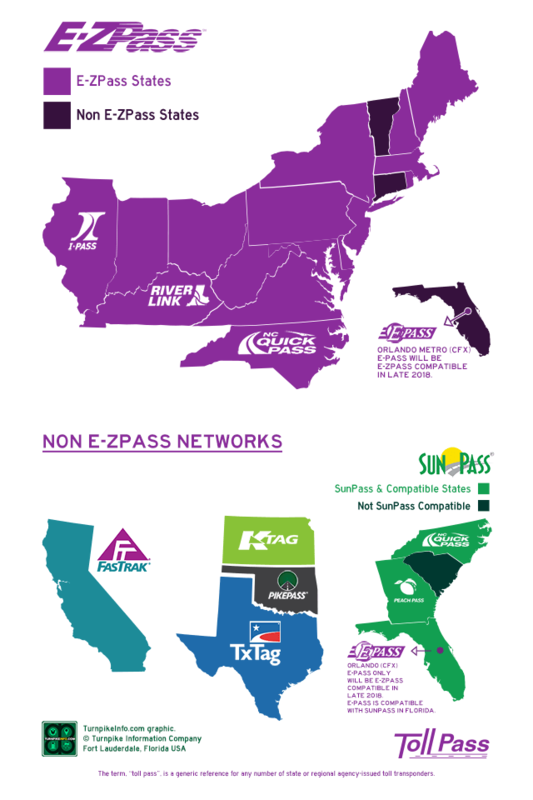 States connected to the E-ZPass system include Delaware, Illinois, Indiana, Kentucky, Maine, Maryland, Massachusetts, New Hampshire, New Jersey, New York, North Carolina, Ohio, Pennsylvania, Rhode Island, Virginia and West Virginia. The Sun Pass is used primarily on state and local toll roads in Florida. It is compatible with Georgia's PeachPass system, and can also be used in North Carolina. It is also compatible with Orlando's E-Pass. Sun Pass is not compatible with E-ZPass. 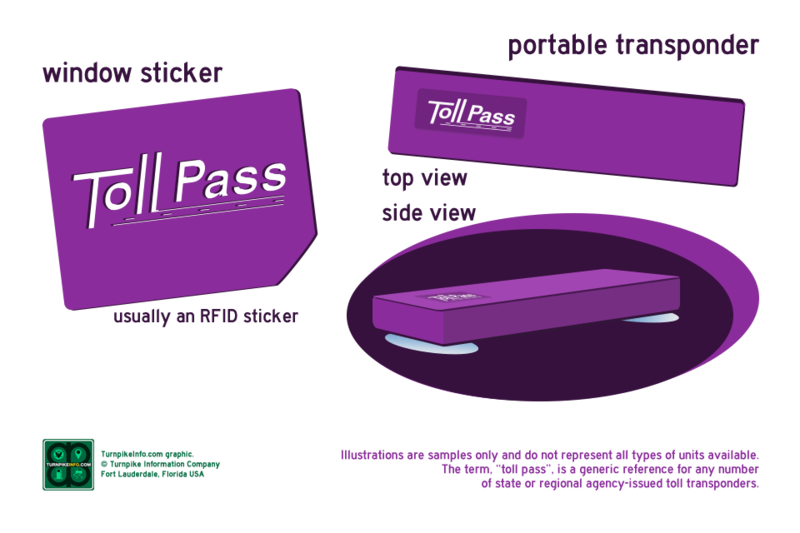 However, E-ZPass may be used on some Orlando toll roads, where the E-Pass is accepted. It may not be used on other Florida toll roads outside the Orlando area. TxTag is the statewide pass used across the state of Texas, and it is nearly compatible with all local and state-operated toll roads. There are two other major regional systems: the TollPass from the Dallas-Fort Worth area and the TollTag from the Houston area. FasTrak is California's statewide electronic toll system. It is not compatible with systems outside California. There are other toll systems in states that operate turnpikes or toll roads, tunnels and bridges. For instance, Kentucky uses a system called RiverLink, for the Ohio River Bridges. In Oklahoma, PikePass is well known to drivers. Georgia uses a system called Peach Pass for express lanes. To find out about your state's pass, select the state of your choice in the menu. There are, typically, two types of transponders issued by each agency. One type of unit is a portable transponder, which is a self-contained device with its own antenna. It will affix to your windshield with suction cups. The other most common type of device is an RFID sticker, which will utilize your windshield as its antenna. Both types of devices have an identification number, which is stored on the circuitry of the device, along with other basic information about the transponder. The unit's ID number corresponds to a database in state records that contains your user account and vehicle information. Portable transponders will have varied features, depending upon which agency issues the unit. Common features include audible alerts when going through toll plazas or a gantry, as well as alerts when account balances are low. Some transponders also have switches to select passenger counts, often used to determine rates on tolled express lanes, as well as to offer carpool discounts on toll roads and bridges. Some units may also include notification lights or LED's (light-emitting diodes). The sticker transponder utilizes RFID (radio-frequency identification) technology printed on a flexible circuit. The entire flexible device is a sticker, which is affixed directly to the windshield. 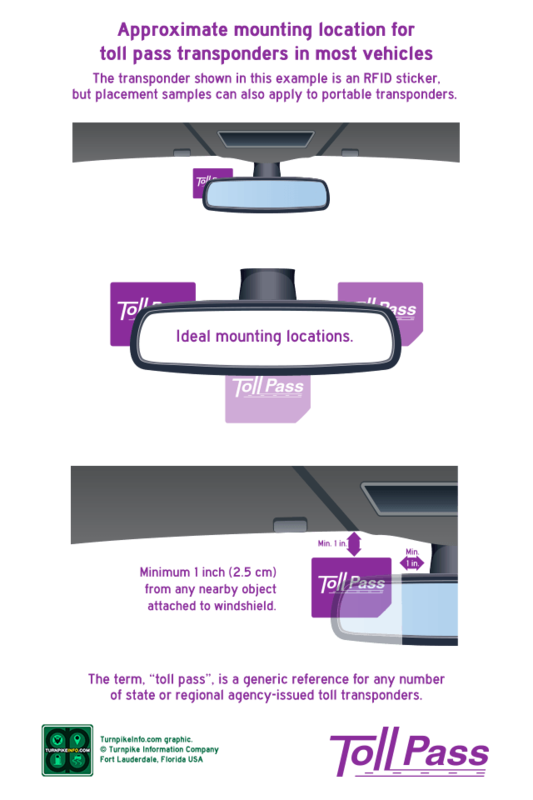 The nature of the circuitry in a sticker means it can only transmit data via your vehicle's GLASS windshield, which acts as a dialectric antenna for the sticker. Sticker transponders can not be used on vehicles that do not have a glass windshield, such as motorcycles. Unlike a portable transponder, if you remove an RFID toll sticker from your windshield, you will, essentially, break the thin electronic circuitry inside the flexible sticker. Once a sticker is removed from your windshield, you must discard it, making sure to deactivate or unassign the unit from your vehicle. Large vehicles, specifically tractor-trailers, and some vehicles with certain options or metal-oxide windows, must make use of an exterior transponder unit that affixes either to the license plate frame or vehicle roof. If a vehicle is in a state where a front-license plate is not required, special mounting brackets and mounting screws will be used to mount a transponder to the vehicle's exterior. If the license plate option is unviable, then a roof-mounted transponder can be utilized. Typically, the exterior transponder is for use by commercial vechicles, but many of todays luxury and higher-end cars use metal oxides in their windshields, and that diminishes the signals from regular transponders. In such cases, special mounting instructions must be followed, or an exterior transponder must be used. The placement of your toll pass is critical to making certain your unit and the information stored thereon can be properly read by electronic tolling equipment. All agencies have a preferred location, adjacent to your windshield's rear-view mirror, about one to one-and-a-half inches (three to five centimeters) from the top of the windshield, and about one to two inches (three to five centimeters) to the left or right of the rear-view mirror. See the illustration for reference. IMPORTANT! Do not place the sticker or transponder in a location that will block the view of the driver or impede your ability to operate your vehicle!